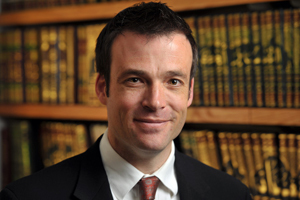 Notre Dame theologian Gabriel Said Reynolds studies the Quran and the interactions between Christians and Muslims. Academic courses taught by Reynolds include Foundations of Theology, Islam and Christian Theology, The Qur’an and Its Relation to the Bible, The Holy Land, and Islamic Origins. He is the author of the forthcoming book The Qurʾan in Conversation with the Bible: The Qurʾan Translation of Ali Quli Qaraʾi Annotated with Biblical Texts and Commentary. Q: How would you describe the research you pursue? A: My research is focused on the study of the Quran in general and the relationship of the Quran to the Bible in particular. I am convinced that the Quran—traditionally thought to have been proclaimed in a largely pagan environment—was in fact proclaimed in the midst of Jews and, especially, Christians and that it is best understood when we understand the way it refers to Biblical literature. The Quran and the Bible, in my opinion, are intimately connected. A secondary area of research is the relationship between Muslims and Christians through the centuries, including theology, culture, and politics. Q: Has the recently intensified persecution of Christians in the Middle East—particularly that inflicted by ISIS—noticeably affected the sorts of interfaith theological scholarship you do? Unfortunately, the persecution of Christians has intensified in many places in the Islamic world, including not only the areas controlled by ISIS but also Nigeria, Egypt, Saudi Arabia, and Pakistan, among other countries. Indeed, the witness of Christian martyrs in these places has not infrequently been heroic. Still, this leaves scholars with a dilemma. On the one hand, it is incumbent on us to speak out in defense of Christians and others who are suffering persecution and bigotry. On the other hand, it is important not to generalize about the attitudes of Muslims towards Christians, as Islam is a diverse religion like any other, and in a special way to recognize the positive role that so many Muslims play in American society. Q: What do you expect, hope for, and/or fear in the future for Muslim-Christian relations? The rise of a particular triumphalist form of Sunni Islam in many parts of the Islamic world is worrying, not only for Christians but also for Shiites and other minorities. Those who believe in this form of Islam advocate aggressively for a strict application of Islamic law and believe that the welfare of Sunni Muslims matters above the welfare of others. They are truly motivated by an “us versus them” ideology. Everything suggests that this ideology is still on the rise. However, other Muslim voices, particularly in the West, are advocating for more pluralist forms of Islam. It remains to be seen if those voices might have an impact on the Islamic world itself and on attitudes there to minorities. Contact: Gabriel Reynolds, 574-631-5138, reynolds@nd.edu. Connect with him on Twitter: @GabrielSaidR.